Every now and then you read a book, turn the last page and just ... sigh. At the beauty and power of words on a page and the feeling they elicit. I've been meaning to read this book for a while, and wish I had. If I Stay tells the story of 17 year-old Mia, an accomplished cellist in her final year, who has a cool and loving family and Adam, a boy she loves. The hardest decision she may have to make is about her college destination which probably won't align with Adam's. Mia is mature and grounded and besides the fact she's uber talented, is a pretty normal teenager. But then tragedy strikes in the most heart wrenching way possible and Mia is in intensive care fighting for her life. Will she live or will she give in and slip away? Gail Forman has weaved a beautiful story interspersed with flashbacks that are filled with love and loving snippets of Mia's life. I was gripped in the story, learning what Mia had to lose, and I would then be back in the harsh reality of the ICU, hoping she would hold on. In essence this is a love story, of different types of love, which flows at a melodic pace, similar to the beautiful music that is referenced throughout. Written from Mia's point of view, she narrates the story of her life as it was and as it hangs in the balance - over 24 hours. For anyone else out there like me who's a bit late to the party and hasn't read this book, I highly recommend it, this is a book you read in one big gulp. 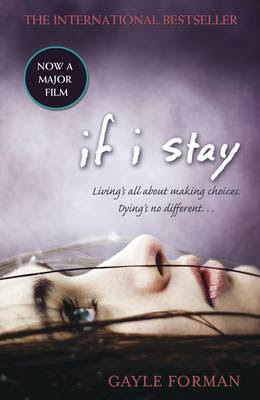 If I Stay has also been made into a film and Forman has written a sequel, Where She Went.